Bones: I confess that in a moment of weakness I took the opportunity to make Dr. Wells feel bad about himself. 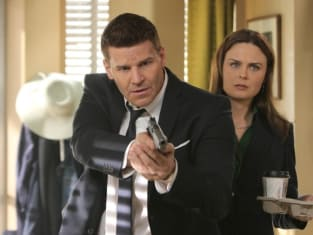 Booth: He deserves it. Trust me. It's probably the first time he's met someone that's smarter than him. Booth: If you could travel through time where would you go? Bones: I'm already there. Here. Bones: Here. The difference between past and future is nowhere to be found in the laws of physics. Everything I want or need is here. Right now. [to Angela] Do I look humble? I'm trying to be less of a douche. Permalink: Do I look humble? I'm trying to be less of a douche. Angela: It's not crazy that I'm worried about, actually. It's arrogance. We're a team here and you can be traded. Wells: Wherever I go, I'm always the smartest person and it always creates problems. Angela: Well maybe you should try being less of a douche. Wells: Just because something is theoretically impossible doesn't mean that it's not possible. Bones: I believe that is exactly what it means. Cam: I would tell him...that I wanted to have tea with Jesus. Hodgins: You're talking about doing another experiment, aren't you? Wells: Perhaps I am your brother from another mother. Wells: You shy away from randomness and that prevents you from casting a wide net. Bones: Are you saying that I'm narrow-minded? Wells: Your words, not mine. Booth: I'm sure you could just bore them to death with your shrinky talk. Hodgins: Is she looking at me like an angry schoolteacher? Booth: Yeah. Yeah, she does that a lot.